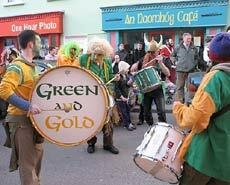 Was Minister o Donoghue "Dingleing" or Daingeanling" when he visited our town, Dingle-Daingean Ui Chuis, today? My mother passed away a month ago. She was born in Dingle and Dingle it always was to her and always will be to me, too! John O Donoghue should be ashamed of himself with his election stunt on your name.I know 7 votes he got last time but will not get this time. Australia says, leave it as Dingle. Our Dad is from Dingle. We all feel that Dingle is also our home! It is a shame that the name of the "Town we love so well is in jeopardy. History shouldn't be erased. It's a shame to take away a name and sense of idenity, especially without popular support. 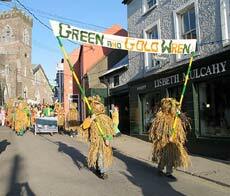 Dingle is Dingle - if a thing is not broken then don't try to mend it! Dingle people know what is in the best interests of Dingle! 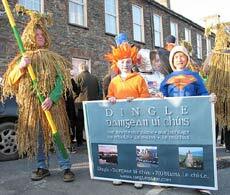 The Government need to bring back Dingle Daingean Uí Chúis now!They r supposed to represent the people and 93% voted for Dingle so do it,Thats ur job! Dingle - Daingean Ui Chuis! Support from Co. Limerick. =) Dingle rocks! I've just seen the pictures on the icecream ireland blog. What is going on. Are the Government bullying Dingle because they stood up to them? Nollaig Shona agus atbhliain fe mhaise daoibh Dingle Daingean Uí Chúis. It looks like Dingle has won the day.Rightly so as that is what the people who live in the ancient town of high renown want.Well done to you all.